Description: Located in the rolling hills just outside of Bandera, the "Cowboy Capital of World," is Twin Elm Ranch. Overlooking the Medina River and Indian Creek, Twin Elm Ranch is a perfect place for families, reunions, youth groups, business meetings, couples, western-style vacations, weddings, and private parties to relax, forget your cares, and enjoy the happy-go-lucky life of the old west. Service is cowboy friendly and your hosts, Cap’n Kury and Miss Victoria will get you settled in and answer any questions you may have about your visit and assist in making horse-riding arrangements and any other activities on the ranch. Lodging & Meals: There are 21 rustic units consisting of a bunkhouse, lodge, cabins, and a pioneer house. Individual, newly remodeled rooms are great for families with children. Some rooms have bunk beds and all have porches. There is a Game Room where you can play ping pong or shoot pool plus a "living room area" with a TV. You can enjoy natures lovely breezes atop a hill but bring along a sweater for cool evenings and beach towels for the river. Enjoy all-you-can eat ranch style cooking three times a day which is included in the very reasonable nightly rate. Amenities and Fun Things To Do: Experienced cowboys will saddle you up with a horse that is just right for you to ride through the breathtaking countryside. Even youngsters not old enough to hit the trails get to ride. 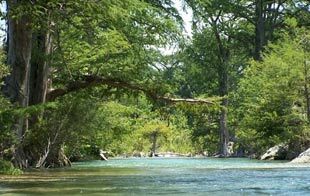 Fish the cypress shaded river, swim in the private pool, or just laze in the shade of a big oak tree. Special activities, like hayrides, barbeques, campfires, and more are included in the low rates. Everyone will enjoy listening to music and tall tales and roasting marshmallows around the campfire after a trail ride and big meal. 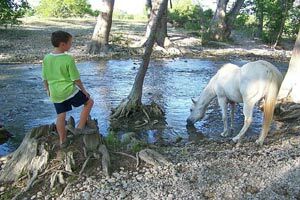 You can spend some time riding the rapids of the crystal clear, spring fed, Medina River which runs through the ranch or try roping, horseshoes, or pool. You won't get bored during your stay at Twin Elm Ranch. Nearby: There are rodeos every Friday night starting in April, ending the Friday before Labor Day (weather permitting) at no charge to Twin Elm guests. The "Cowboy Capital of Texas" is close down yonder and is known for its restaurants and original Texas Honky Tonks - several dance halls and nightclubs within a few blocks of each other with friendly and lively locals, and great Texas country music. If you want to get off the horse and drive into the early dawn for a round of great golf in the Hill Country, you have lots of nearby choices - see this golf map to locate a course - our favorites are Tapatio Springs in Boerne and La Cantera Resort & Spa on the northwest outskirts of San Antonio. If you have the time, you're about 50 miles from three great cities to explore - Kerrville, San Antonio, and Boerne - all have enough fun things to keep you busy for days.